The origins of flamenco lie deep within the history of Spain. Its four elements are voice (cante), dance (baile), guitar (toque), and hand clapping, foot beating and shouts of encouragement (jaleo) all connected through what is called duende (soul). 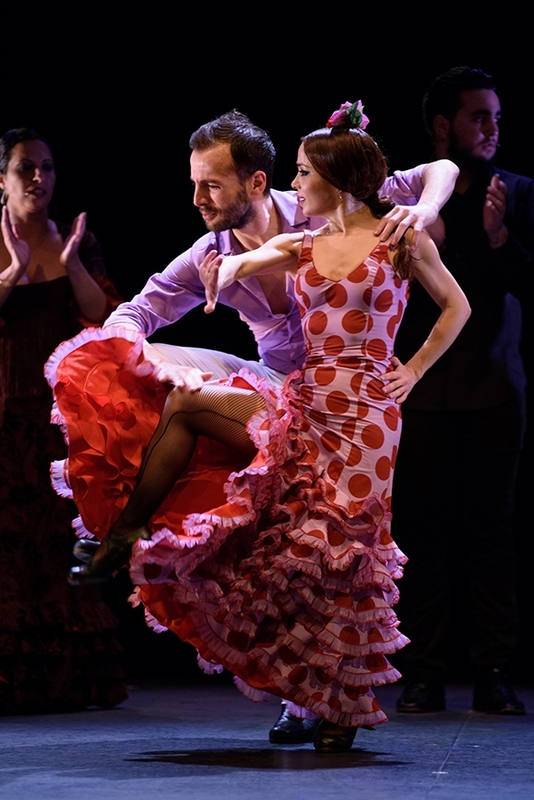 Although dance is just one element of flamenco it is the most readily recognisable: the arched back and arms, sharp, steely lines, shapely costumes, florid gestures of the wrists and hands are all signifiers of its long tradition. What we see tonight is flamenco in a contemporary theatrical setting in which tradition and commercial development are combined. What is apparent in Paso a Dos is an interesting contrast: while the musical element still evokes the rough depths of emotion, of pain and suffering from which flamenco arose, the dance is refined and polished. When the singers in Paso a Dos draw up such rich and visceral sounds from their depths it is as if they are coming from another time and place, sometimes uncomfortably so. There is nothing uncomfortable about the dance, however, which is rich in its smoothness and litheness without any visible reminders of the suffering in its musical accompaniment. This is immediately apparent in the opening section where the six musicians are seated next to each other. When Ismael El Bola begins to sing his voice gives form to a contorted dance of its own; his facial and corporal gestures seem to come directly from the passion of the song. When Flores and Pericet enter they strut through the music in a line of elegant stretch that winds up like a spring ready to release. And release it does, in flashes of mercurial posture and riveting beaten foot rhythms while the arms sing like a melody. The two forms together suggest that the voice is the rough earth from which the elegant flower of the dance emerges in its beauty and sensuality. These levels of expression are what make flamenco so complete. And yet there is something in Paso a Dos that is less than compelling as a theatrical performance. Interestingly, it ‘originated from an idea by poet and flamencologist José Maria Velázquez-Gaztélu’ as an illustrated conference on the art of duo dancing in which the poet’s words alternated with Pericet’s and Flores’ dance. The two dancers subsequently ‘developed Paso a Dos, turning it into a dance show.’ So the idea of the dance developing out of the music is here turned on its head and the integrated experience in which all the elements of flamenco arise from the same source is reduced to the piecing together of elements under a single idea: the show. The bland entrances of the dancers are the unfortunate vestige of the lecture demonstration. There is no lack of virtuosity, however. Pericet and Flores can hammer out the fastest beats and turns, and their partnering is a passionate display of precise attention. When Flores places his hand on Pericet’s waist or shoulder, he is not simply holding her but communicating with her through his fingers that continue a dance of their own. Pericet’s solo simmers with suppressed energy until she lets fly with her feet and swirls her long dress like an ornate and very lively fishtail. She expresses a range of emotions in her dances, while Flores, ardent as he is, tends to maintain a similar register throughout. The same cannot be said of the musicians: the two guitarists (Antonia Jiménez and Victor ‘El Tomate’) strum and pick their way through Spain with melancholy beauty and fire, while the four singers (El Bola, Miguel Lavi, Mercedes Cortés and Inma Rivero) each wrench from their bodies the most exciting vocal shades and rhythms; Rivero seems to exorcise her words with her fists. Each song, each instrumental solo or duet is rich in expressive power. So while all four elements of flamenco are present in Paso a Dos, each performed by artists at the height of their powers, it is the form of the show itself that disappoints; its overall effect falls short of being any more than the sum of its parts.